Here's a clip (before it gets deleted) of Rober Griffin III at the Redskins draft party at FedEx field on Saturday afternoon. The NFL Network had cameras on hand and showed a clip of the injured quarterback taking the stage. 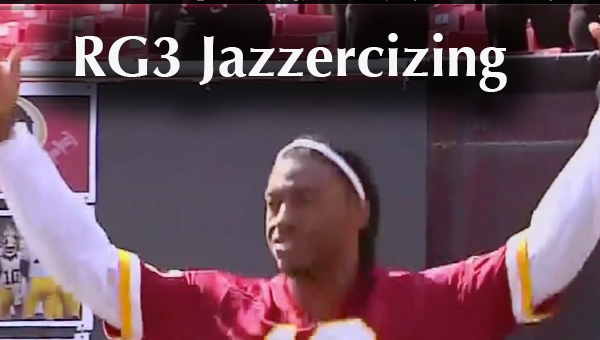 RG3 got the crowd pumped up and chanting his name by doing an exercise that my great grandmother does every morning, jumping jacks. Robert did a whole 2 of them which of course is an equal comparison to running around the field avoiding 300 pound monsters who are all trying to snap your leg in half. When his speech was over, RG3 did a quick foot running drill as he headed off stage, also caught on video by a fan.